I don’t get to New York nearly enough, so Steve and I are really looking forward to two appearances coming up on March 28 and March 29, and we hope to see you there! 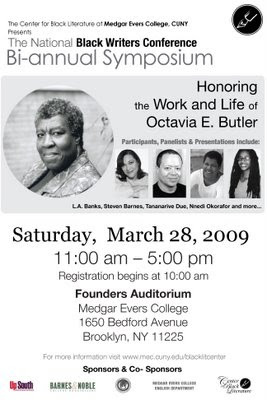 A few weeks ago, I realized that it was the third anniversary of Octavia E. Butler’s death. For me, it was a sad morning. I remembered missing my last chance to see her at a Fledgling book-signing at Eso Won Books here in L.A. only months before she died. (It was Halloween, and my son was going trick-or-treating for the first time.) And how, months later, an email arrived from a magazine journalist who had a friend who lived in Octavia’s Seattle neighborhood and had heard a heartbreaking rumor. And how Harlan Ellison, her mentor, called us to confirm our worst fears: Octavia was gone. It is still difficult for me to see her photo. But while these past three years have been a struggle for all of us who knew and loved Octavia’s work—and Octavia the person—she is not really gone at all. Her literature remains. Our memories remain. Her vision remains. My husband, Steven Barnes, and I have been invited to New York to help celebrate Octavia, returning to a beloved and familiar venue. The National Black Writers’ Conference Bi-Annual Symposium is celebrating the life and works of Octavia E. Butler Saturday, March 28. It’s a daylong symposium, from 11 a.m. to 5 p.m., at Medgar Evers College, 1650 Bedford Avenue in Brooklyn. Steve and I will reflect on Octavia and the influence of her work early in the day. Steve and I both knew and loved Octavia. Steve had known her for decades, and I met her in 1997 at the same conference on black speculative fiction at Clark Atlanta University where I met my soon-to-be husband. After that conference, my life would never be the same. Octavia kept a photo from that conference framed on her wall—me, Octavia, Steve, Samuel “Chip” Delany and Jewelle Gomez. “My other family,” she explained when we remarked upon it. Now, a new family in black speculative fiction will appear to honor her: Other panelists throughout the day will include my hubby and fellow NAACP Image Award winner Steven Barnes (Lion's Blood and the upcoming Shadow Valley, his sequel to Great Sky Woman), New York Times bestselling author L.A. Banks (The Vampire Huntress Series) and fantasist Nnedi Okorafor, author of Zahrah the Windseeker. For more information, visit http://www1.cuny.edu/forum/?p=3384. To say that I feel honored and humbled is an understatement. I live every day in the knowledge of how blessed I am to be able to make a living doing what I love. I’m gratified that readers support my work, period. That’s something no writer can take for granted, especially during tough economic times. When I started publishing, I had never heard of speculative fiction. 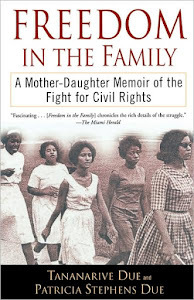 I had read Gloria Naylor’s Mama Day and Toni Morrison’s Beloved (and lots of Stephen King! ), but I had never read other black writers who wrote about the supernatural, or who wrote about the future. But I stepped out on complete faith with my first novel, The Between (1995), with the hope that someone would care about the stories I wanted to tell of life, death, healing and love—with a few spooky moments. Without the success of Terry McMillan and Waiting to Exhale, my road would have been much harder. It has been a magical, life-changing ride ever since. I want to thank my editor at Atria Books, Malaika Adero, as well as the other organizers for their hard work creating this event in my honor. And I want to thank my faithful readers for carrying me thus far on the way. The event is at 5 p.m. at Faison’s Firehouse Theatre in Harlem, 6 Hancock Place/124th Street (between Morningside and St. Nicholas avenues). Steve and I will be presenters, as well as poet and author Opal Palmer Adisa (author of Until Judgment Comes and Eros Muse). There will be books for sale, and I will be happy to sign them. I don’t make it to New York nearly often enough, so I’ll also be glad to see friends and readers. - Comment: I just 'connected the dots' on a review I had read last year on _Joplins Ghost_, a great review, and had intended to read the novel but have not yet. The comment is, in case you don't know this, you should make a point of going to the brownstone that Joplin owned in Harlam. It was a personal thrill for me to have walked past that house, seen the plaque, knowing so much of his great music had been written there. - Question: Octavia Butler, there's a bit of an internet rumor going around that 'Parable of the Trickster' was nearly complete, and that possibly it will be completed by you or Barnes. Is there any truth to this?